Allergies in Pet’s. Yes, they have allergies too! When I just started studying veterinary science, my siamese cat “Tovja” had her kittens in my room. Out of the blue, I started getting severe asthma attacks and rashes and hives – and for a short while, I had to reconsider continuing my studies, if this was the way I would react to my patients! The alternative study recommendations were not appealing to me and armed with my antihista- mines and asthma medicine I soldiered on in my veterinary studies and it seems my immune system managed to cope – although from time to time I still get asthma and some patient’s fur makes me itch. Allergies to pet’s which humans suffer from is well known, as are allergies in humans in general, but few people realise that pet’s can have allergies too. In Human’s, allergies mainly present with sneezing and watery eyes and itchiness, and although we sometimes see these symptoms in animals, their allergies usually present as severe rash in certain areas of the body and ears and on the feet and paws – the other difference is, that human’s respond relatively well to antihistamine medication, where this is not so with pet’s. Flea Allergies: This is the most common allergy in Pet’s. It does not mean, that your pet has a lot of fleas, it mean’s that your pet is reacting severely to the saliva the flea injected into it’s body when it was bitten!While fleas on their own are very irritating to a pet and us – some pet’s will react more severely than other’s when bitten. In dog’s this mainly presents as a severe rash on the lower back and base of the tail, and in cat’s behind the ears and under the chin.Getting rid of the flea’s will be the number one priority in such a case, but because certain reactions took place in the pet’s system due to an overreaction of white blood cells, it will also be necessary to treat the patient with short term cortisone, supplemented with antihistamines. Flea control though, should NOT just be aimed on the one pet-but all pet’s in the household, as well as environmentally controlled. Talk to you Veterinarian for options! 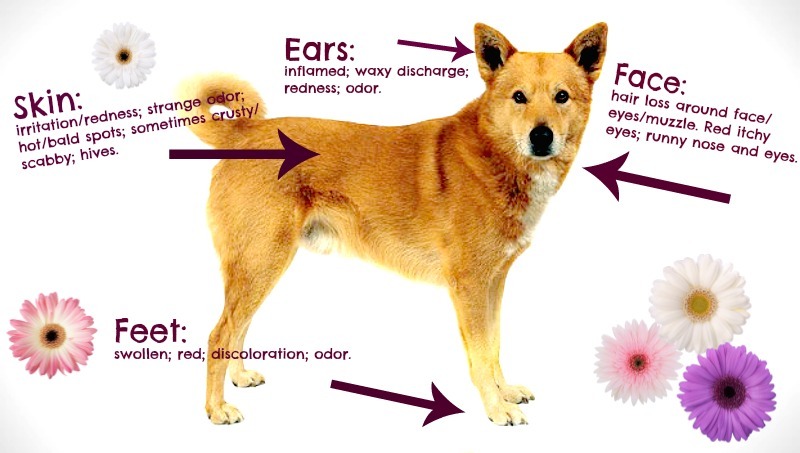 Atopic Allergies: These are reactions to allergens that Pet’s inhale, similar to our hay-fever. Unfortunately not as easy to control as drinking one antihistamine daily. The Pet has more wide-spread areas over the body which are itchy.Although there are now blood tests available to test what your pet is allergic to, costs still are inhibitive in performing these readily. The next obstacle is that often it will be impossible to restrict your pet from inhaling or having contact with these allergens, which often forces us to just try and alleviate the symptoms.What we have found out so far though, is that most allergic pet’s are allergic to a multitude of allergens and not just one – sometimes up to more than 20! Regrettably the safer treatment options – e.g. making patient specific vaccines and cyclosporine (a safer and stronger anti-inflammatory than cortisone), is also very expensive and we often end up controlling the symptoms with more affordable, albeit not always the safest options i.e. cortisone combined with antihistamines. A Pet can be eating the same brand of food for year’s and out of the blue develop an allergy to it! A rash can develop all over the body and specifically the ear’s. Constant licking and biting the feet might also be a symptom. Another symptom- although rare, could be an upset stomach. Again there are blood tests available to determine to which ingredient your pet is allergic to, which could help us determine which ingredients to avoid, but as mentioned these are cost restrictive. Just changing your pet’s diet is not sufficient, it would have to be changed to a specific diet for at least 3 months and avoiding ANY treats or xtra’s which could have been contributing to the allergy. Just recently we had a cat patient, that out of the blue became allergic to chicken (try finding a cat diet that is not predominantly chicken based?)! Veterinary food companies have however come up with a multitude of dietary options to help these allergic patients – from hypoallergenic food (I.e foods that contain proteins and grains that would normally not be found in pet food like duck or lamb and beetroot) to foods where antihistamines are added in the food to food where the protein – although a “normal” protein like chicken is altered to a form in which the body will not react to it – which one to try will best be discussed with your veterinarian. There are even treats available in these ranges! Contact Allergies: These are often quite easy to figure out and easy to correct. Very often when a pet received a new-mostly plastic, and mostly RED coloured food bowl, it will develop a rash around the mouth or facial area, as will they develop a tummy rash after getting a new blanket or a rash on the paws after using a new detergent for your floor – removing the allergy causing object or substance will often lead to resolution of the allergic reaction ( initially with a little medical intervention by your vet).Although grass allergies would theoretically fall into this category, they are not so easily managed and will fall into the `atopy` section (unless you would be willing to replace your lawn with an artificial substrate?). Bacterial Allergies: These are documented in specific species like Bull Terrier’s, Pit Bull Terrier’s, Staffordshire Terriers and Boerboel, where the body reacts severely to bacteria in the skin – mostly a staphylococcus, causing a lifetime of discomfort for patient and owner.These patients tend to end up using antibiotics almost non stop with cortisone added to the mix. There is an option now to also develop a vaccine specifically for an individual patient – this they will also need to use life-long! So, Pet Allergies are not so straight forward to control and talking to your vet about which options would suit your life-style and budget best and realising that there will be fall backs from time to time and remain open-minded that no individual will respond the same to one specific treatment is the best way to approach it when your pet has allergies. Also that treatment will most probably be life-long! It is always so sad to hear, that people avoid getting pet’s for their children because of the fear of allergic reactions. There are so many benefits to a child growing up with a pet! The benefits of the human-animal bond could far outweigh the possibility of treating allergies! If controlling the allergy – which your child will most probably outgrow – with antihistamines is not an option for you, then consider getting a dog or cat that are hypoallergenic. President Obama from the U.S. was at the forefront of this and instead of not getting a dog because he is allergic, he got a Portuguese water dog, which they all as a family could enjoy. Dog’s:Poodles (toy, miniature and standard), Maltese, Yorkshire Terrier, Schnauzer (miniature and giant), Shih Tzu, West Highland White Terrier, Bichon Frise, Airedale Terrier, Greyhound, Bouvier, Chinese Crested, Basenji. 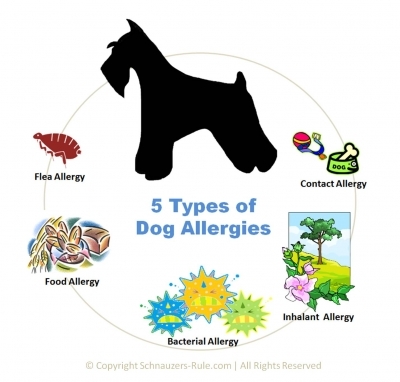 Keep in mind, that often the allergen is not directly the pet, but the dander and irritants that it carries around in it’s hair and that measures can be taken to reduce the allergens e.g. bathing your pet regularly. Clean the house frequently and thoroughly (specific vacuum cleaners available), wash pet bedding and couch and cushion covers often. Remove carpets that accumulate allergic substances. It might also be worthwhile determining if you are actually allergic to your pet or something it accidentally carries around in it’s coat e.g a pollen from a tree when walking your dog?